Anecdotes and findings presented by generous readers of this site. An overview of documented sightings throughout Ireland. A look at the researchers credited with drawing modern interest to the subject. Recorded instances where the animals in question have allegedly been slain or captured. Reports of the creatures seen on shore. Organized attempts to identify or capture a live specimen. 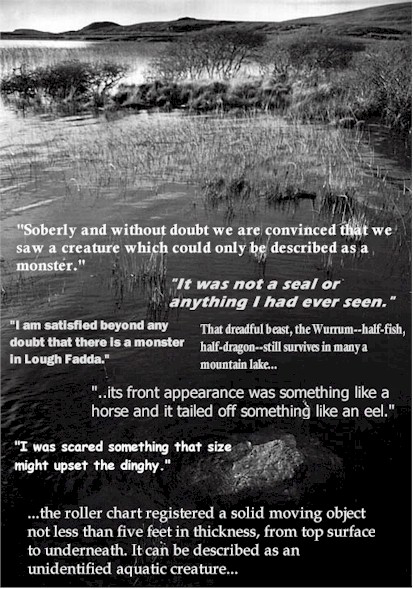 A look through the various depictions of lough monsters that have surfaced over the years. "There are marten cats and badgers and foxes in the enchanted woods but there are of a certainty, mightier creatures, and the lake hides what neither line nor net can take." 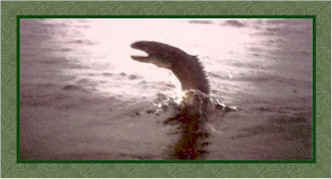 Mighty creatures, the likes of which no mere line nor net can take, have longed been reputed to inhabit lakes and rivers throughout Ireland. Across the bog lands of Connemara horse-eels kept children and turf cutters alike far from the shoreline in the evening. In the mountains of Kerry wurrums were said to presided over lakes and pools. Lakes in County Mayo were once reputed to harbor the murderous dobhar-chu. And throughout the Shannon lurked powerful peistes; capable of tearing nets apart and towing helpless fishermen. Such beasts were at times revered as deities, detested as pests; captured by accident in some instances and sought out and killed in others. No matter what degree of familiarity farmers and fishermen may have held of them it was never enough to warrent formal recognition amongst the acedemic community. This website is part of an ongoing laymen effort to actively explore the prospect of the continual existence of unrecognized species within Ireland. The majority of data presented is sourced from the on-site investigations by the late F.W. Holiday and Captain Lionel Leslie as well as the in depth research conducted by Dublin author Peter Costello. Also included are new findings made available through the field investigations of the site's authors, Gary Cunningham of Newry and Nick Sucik of Arizona. An attempt to catagorize and distinguish the various forms mystery creatures based upon traditional Celtic lore. The extent of Ireland's tradition of strange and elusive 'mystery animals' is far from limited to those of an aquatic disposition. Given the nature of this site, its only fitting that some focus be spent upon the various reports of terrestrial (and ariel) oddities. An in-depth look into big cat sightings, both modern and historical. Whereas imported escapees may be something of a recent phenomena; reports, or references, of large felines have a lengthy history of their own and may have even been partly responsible for lore surrounding the Phantom Black Dog. In his second installment Neil takes a look at the big cat reports, and the at times comical hysteria that followed them, in Co. Antrim during the late summer and early fall of 2003.